When you want to dispose of your unwanted waste and junk, call us today! You don’t have to look far, we here at Handy Rubbish are the experts at dealing with business, building, furniture and domestic rubbish. We are a long established rubbish clearance Enfield Wash company who know the correct procedures in taking away and recycling all types of rubbish. We have years of experience in this industry. We can sort, load and take away almost anything. 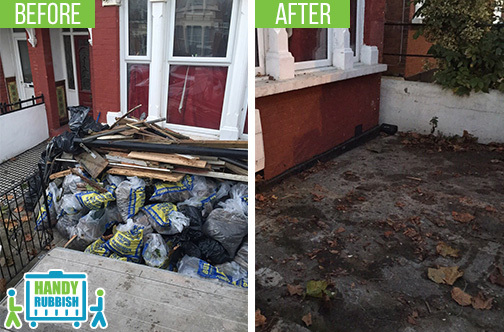 Our team of professionals will arrange rubbish removal Enfield Wash EN3. You will be impressed with our fast and efficient work and our affordable prices. From a small amount to a massive load, we can help. Call for a free quote now on 020 3540 8282. When you are having new furniture in your home or office make sure you hire us to help with remove all of your unwanted furniture. You can rely on us to recycle what we can and if your furniture is in good condition make sure it goes to a good charity that can make use of it. We are fully aware of all the methods of safe waste disposal EN3 to protect the environment. Our trucks are specially designed for your furniture collection. We follow all of the necessary health and safety regulations. Nothing beats out our prices! We offer first-class Enfield Wash EN3 rubbish disposal service at a fair cost. When you have any type of building work then it can be tough dealing with the various materials that leftover after the work. Whether you are having some decorating done or major renovations we can help. Our builders waste clearance service is the first choice when you need the rubble and waste removed. You can call on us to deal with the sorting, loading and recycling. All of our Enfield Wash waste removal services are reasonably priced and will appeal to all. From domestic to commercial needs our professionals can help when you want. We guarantee reliable service. We are certified and will remove all of your rubbish safely. Call us now and ask for more details about our latest offers. Hire us today for your Enfield Wash waste clearance EN3 needs. We are the professionals and are here to help with the clearing of the things you don’t need. If you are in time of a tidy up your property and have discovered a ton of waste then hire us at Handy Rubbish. We can remove all of your waste within the EN3 area, and take it away leaving you free of clutter. All of our procedures are safe and done in accordance with the specified regulations. Our waste collection Enfield Wash is a top-quality service at a good price. Contact us now on 020 3540 8282, and book your rubbish clearance service with our supportive customer service. 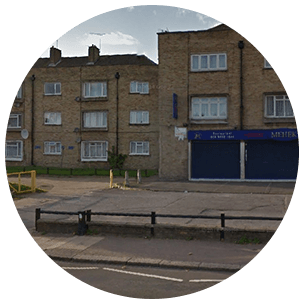 Affordable and high quality waste removal services in EN3 - that’s what I received when I hired them and look forward to receiving it again for future jobs in Enfield Wash.
- Reviewed by Kim Y.
Enfield Wash is located in the district of Enfield in North London. It is surrounded by the areas of Enfield Lock, Enfield Highway, Freezywater and Bulls Cross. The main postal code is EN3. Enfield Wash is situated either side of Hertford road and sits between Bell Lane and Ordnance road. The area has excellent transport connections, with tub, train and bus links to other areas. There is a bustling high street with shops, bars, cafes and restaurants. The area has plenty of amenities, schools and residential areas. Albany Park offers open space and Albany Leisure Center supplies plenty of sporting opportunities.